Here it is! The latest eBook Guide from The Motoroamers to hit the stands. It’s been a bit of a mammoth project although with one final push we’ve made it! Claim yours now! It’s FREE! Just click the image for your own personal copy of this Guide! After 24 months of full-time travel in our motorhome, we have reached so many parts of Europe; from Spain in the west, Crete in the south and Poland and Romania in the east. We have experienced so much richness and encountered cultural diversity. Yet what has made our travels all the more colourful has been the challenge of conversing with the locals. From early on in our marriage, some 29 years ago, we learnt the value of speaking the local tongue and came to understand how important it was to at least try to speak some of the lingo. From those early days, our classroom became this huge European canvas where every country pushed us. Even with Myles who has a head for languages and is reasonably fluent in German and French has been stretched. So is from here that our Getting by in Guide was conceived. Whilst we realise there are other resources out there like Google Translate, we thought it would be useful to pull together a collection of words and phrases that have been essential to us in our travels and compile the translations from 14 European countries. Thanks to the help of people we’ve met along the way and locals who speak the lingo, this massive project finally comes to fruition and we are grateful to everyone for their help. It is not meant as a replacement or a stand alone tool, because of course there are no pronunciations attached to this. Although it is meant to be a helpful starting point as you plan your trips to a country and combined with Google Translate or other Language Apps that are available it is hoped to be a useful conversational tool. As we visit more countries, the Guide will evolve and new pages will be added from our experiences, so this will be living and breathing with us as we tread the roads of Europe. 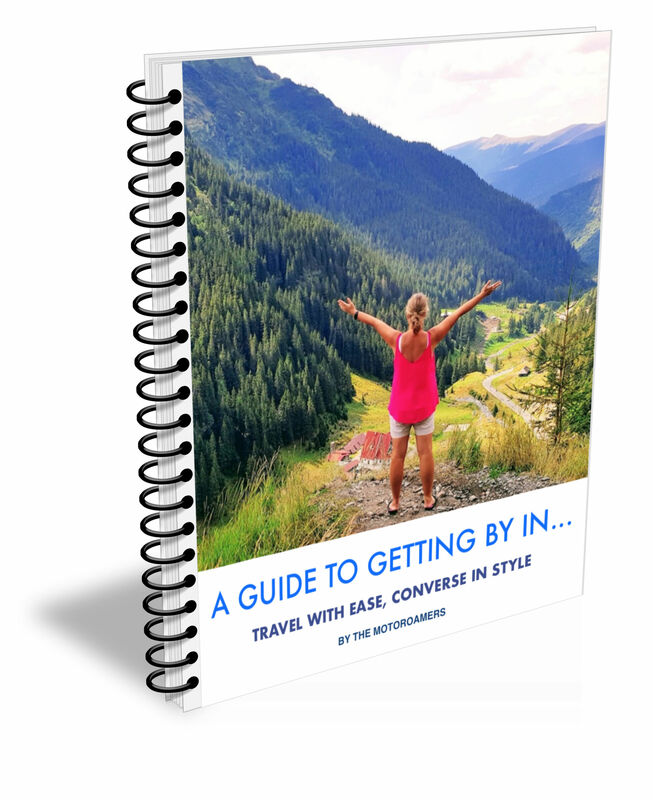 So why not download this Guide and find a smoother way to get down with the locals and find your confidence in getting what you need, when you need it. Click the book image or HERE to download your FREE copy now!